In June 1979, a man using the pseudonym Robert C. Christian approached the Elberton Granite Finishing Company on behalf of "a small group of loyal Americans", and commissioned the structure. Christian explained that the stones would function as a compass, calendar and clock, and should be capable of withstanding catastrophic events. Joe Fendley of Elberton Granite assumed that Christian was "a nut" and attempted to discourage him by giving a quote several times higher than any project the company had taken, explaining that the guidestones would require additional tools and consultants. Christian accepted the quote. When arranging payment, Christian explained that he represented a group which had been planning the guidestones for 20 years, and which intended to remain anonymous. Christian delivered a scale model of the guidestones and ten pages of specifications. The five-acre (2 ha) land was apparently purchased by Christian on October 1, 1979,[non-primary source needed] from farm owner Wayne Mullinex. Mullinex and his children were given lifetime cattle grazing rights on the guidestones site. The monument was unveiled on March 22, 1980, before an audience variously described as 100 or 400 people. 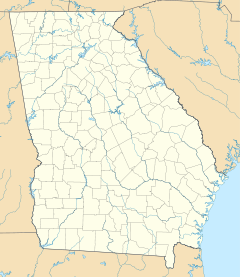 Christian later transferred ownership of the land and the guidestones to Elbert County. 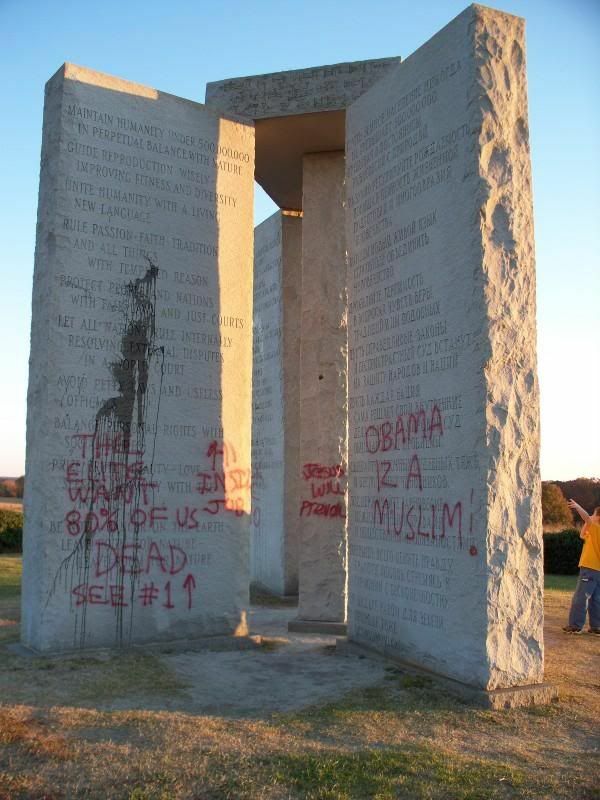 In 2008, the stones were defaced with polyurethane paint and graffiti with slogans such as "Death to the new world order". Wired magazine called the defacement "the first serious act of vandalism in the guidestones' history". In September 2014, an employee of the Elbert County maintenance department contacted the Federal Bureau of Investigation when the stones were vandalized with graffiti including the phrase "I Am Isis, goddess of love". 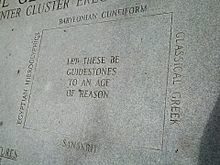 A message consisting of a set of ten guidelines or principles is engraved on the Georgia Guidestones in eight different languages, one language on each face of the four large upright stones. Moving clockwise around the structure from due north, these languages are: English, Spanish, Swahili, Hindi, Hebrew, Arabic, Traditional Chinese, and Russian. A few feet to the west of the monument, an additional granite ledger has been set level with the ground. This tablet identifies the structure and the languages used on it, lists various facts about the size, weight, and astronomical features of the stones, the date it was installed, and the sponsors of the project. 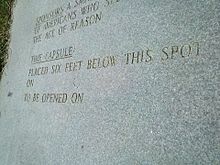 It also speaks of a time capsule buried under the tablet, but spaces on the stone reserved for filling in the dates on which the capsule was buried and is to be opened have not been inscribed, so it is uncertain if the time capsule was put in place. The four outer stones are oriented to mark the limits of the 18.6 year lunar declination cycle. The center column features a hole drilled at an angle from one side to the other, through which can be seen the North Star, a star whose position changes only very gradually over time. The same pillar has a slot carved through it which is aligned with the Sun's solstices and equinoxes. 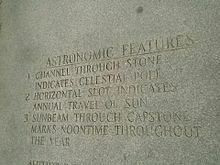 A ​7⁄8in (22 mm) aperture in the capstone allows a ray of sun to pass through at noon each day, shining a beam on the center stone indicating the day of the year. Yoko Ono praised the inscribed messages as "a stirring call to rational thinking", while Wired stated that unspecified opponents have labeled them as the "Ten Commandments of the Antichrist". The guidestones have become a subject of interest for conspiracy theorists. One of them, an activist named Mark Dice, demanded that the guidestones "be smashed into a million pieces, and then the rubble used for a construction project", claiming that the guidestones are of "a deep Satanic origin", and that R. C. Christian belongs to "a Luciferian secret society" related to the "New World Order". At the unveiling of the monument, a local minister proclaimed that he believed the monument was "for sun worshipers, for cult worship and for devil worship". Others have suggested that the stones were commissioned by the Rosicrucians, with conspiracy theorist Jay Weidner observing that the pseudonym of the man who commissioned the stones – "R. C. Christian" – resembles Rose Cross Christian, or Christian Rosenkreuz, the founder of the Rosicrucian Order. Alex Jones's film Endgame: Blueprint for Global Enslavement proposes that the guidestones are a harbinger of self-appointed elites who intend on exterminating most of the world's population. The most widely agreed-upon interpretation of the stones is that they describe the basic concepts required to rebuild a devastated civilization. Author Brad Meltzer notes that the stones were built in 1979 at the height of the Cold War, and thus argues that they may have been intended as a message to the possible survivors of a nuclear World War III. The engraved suggestion to keep humanity's population below 500 million could have been made under the assumption that war had already reduced humanity below this number. The guidestones were briefly shown and discussed in the 1986 documentary film Sherman's March, and were featured extensively in a 2012 episode of Mysteries at the Museum, a "Monumental Mysteries Special" featuring Don Wildman. ^ a b c d e f g h i j k l m n o Sullivan, Randall (2009-04-20). "American Stonehenge: Monumental Instructions for the Post-Apocalypse". Wired. 17 (5). ^ "Land parcel information". Archived from the original on 2008-10-17. Retrieved 2008-08-07. ^ "Parcel map". Archived from the original on 2009-09-07. Retrieved 2008-08-07. ^ a b Moran, Mark McGuire; Sceurman, Mark (2004). Weird U.S. Barnes & Noble. p. 193. ISBN 0-7607-5043-2. ^ "Defacement of the Guidestones". Retrieved 2009-05-09 – via Photobucket. ^ Wayne Ford (8 September 2014). "Vandals deface mysterious Georgia Guidestones in Elbert County". Online Athens. Retrieved 3 October 2014. ^ Eveleth, Rose (2013-09-10). "Nobody Knows How to Interpret This Doomsday Stonehenge in Georgia". Smithsonian. Retrieved 9 October 2017. ^ Gary Jones (2005-05-18). "The Georgia Guidestones: Tourist Attraction or Cult Message?". The Elberton Star. Archived from the original on 2012-04-21. ^ "Endgame – Alex Jones". YouTube. 24 December 2009. Retrieved 10 October 2016. ^ "Apocalypse in Georgia". Brad Meltzer's Decoded, episode 110 (February 3, 2011). ^ Monumental Mysteries. Travelchannel.com (2012-07-13). Retrieved on 2013-08-21. Fanthorpe, R. Lionel (2005). Mysteries and Secrets of the Templars. Toronto: Dundurn Group. p. 180. ISBN 1-55002-557-0. Schemmel, William (2006). Georgia Off the Beaten Path. Globe Pequot. p. 206. ISBN 0-7627-4199-6. Sullivan, Randall (May 2009). "American Stonehenge: Monumental Instructions for the Post-Apocalypse". Wired. Condé Nast. 17 (5). ISSN 1059-1028. Retrieved 19 April 2009. Wiley, Raymond (2011). The Georgia Guidestones: America's Most Mysterious Monument. The Disinformation Company. ISBN 978-1-934708-68-2. Wikimedia Commons has media related to Georgia Guidestones. Dunning, Brian (March 23, 2010). "Skeptoid #198: The Georgia Guidestones". Skeptoid.